Walla Walla has an affordable housing crisis. But what is “affordable housing” and who is this crisis affecting? These are the types of questions the Walla Walla community must know the answer to before we can vote on Walla Walla County’s plan to increase taxes to fund affordable housing projects. This piece is the first in a series explaining housing in Walla Walla, the history of the problem, and possible plans to solve the crisis. Affordable Housing is achieved when the cost of housing (mortgage payments, insurance, taxes, utilities, and/or rental costs) is less than 30% of the household income. What is the difference between family median income and household median income for Walla Walla? Family income is the total income of a given family (family members related by birth, marriage, or adoption) living within one home. The median family income is the average income for families in a given area, where the average is found by picking the middle value in a list of all the families’ incomes arranged from high to low. Household income is usually less than family income and is defined as the total income of all individuals in a given home — this can vary from a single individual living alone to many unrelated individuals sharing a residence. The median household income is found the same way as the median family income, by choosing the middle-most income. Where is Walla Walla right now? What is the median family income for Walla Walla? According to the Washington State Department of Commerce, in 2015, the Walla Walla Median Family Income was $58,100. The wage distribution for 2015 is broken down further below. The orange represents Walla Walla County (including parts of surrounding counties), while the gray represents the United States as a whole. By switching between values from 2014 and 2015 (by selecting the year at the bottom of the graph), you can see the the percentage of workers making less than $10,000/year decreased from 16% to 11.7%, a positive indication. Below is a graph of the wage distribution of Walla Walla County between 1999 (blue) and 2006 (orange). The 2015 graph includes significant parts of rural Benton and Franklin Counties and the data categories between the two graphs do not line up, which makes it harder to analyze trends in the data between the early 2000s and today. A key takeaway from this graph though is the percentage of workers making less than $50,000 a year. In 1999, the percentage of workers making <$50,000/year was 65.4% while, by 2006, this percentage had decreased to 58.1% – another positive indicator. So what housing can residents of Walla Walla afford? The National Low Income Housing Coalition has released data about the affordability of two bedroom homes for 2017 in Walla Walla County. The whole report can be found here. $14.73 per hour, or $30,640 annual income: Income necessary to afford a two bedroom home in Walla Walla County. $11.44 per hour: Average renter’s hourly wage. 1.3 minimum wage jobs: Number of minimum wage jobs required to to meet an annual income of $30,640. $766: Average monthly cost for a two bedroom home in Walla Walla County. $595: The monthly rent affordable for the average renter’s wage of $11.44. Who is most unable to find affordable housing? Those who make <50% of Walla Walla’s median income are most affected by the affordable housing crisis. According to the Washington State Housing Needs Assessment of 2015 for Walla Walla County, for families that earn 0-30% of the median family income ($0 – $17,430/year), there are only 8 homes available for every 100 needed. For families that earn 30-50% of the median family income ($17,430 – $29,050/year), there are only 30 houses available for every 100 needed. The projections estimate that the situation will only marginally improve by 2019 if Walla Walla County does nothing new. 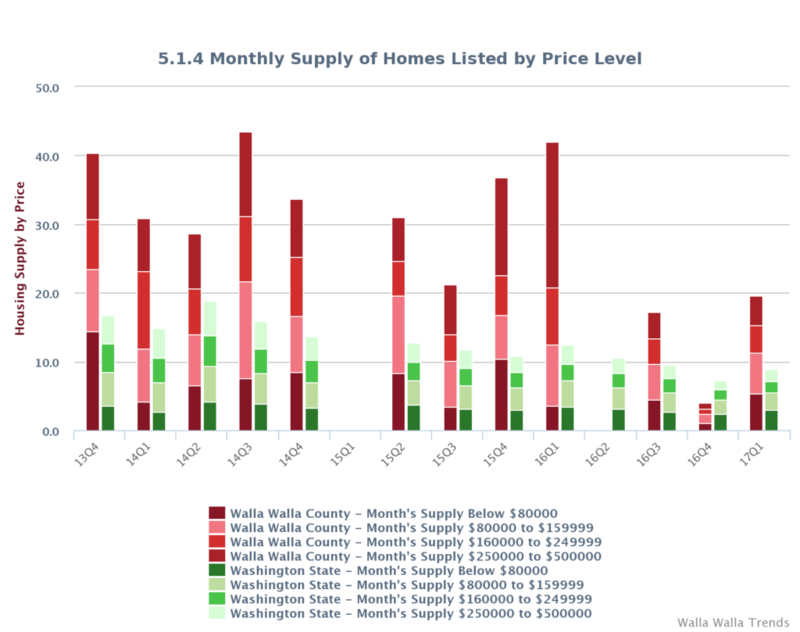 What is the Monthly Supply of Homes for Walla Walla? The monthly supply of homes is a metric that quantifies the time until all homes on the market are sold, assuming no new units are listed. 5.4 months for homes valued below $80,000, decreasing from 14.3 months since 2009Q1. 5.9 months for homes valued at $80,000 to $159,999, decreasing from 9.6 months since 2009Q1. 4.0 months for homes valued at $160,000 to $249,000, decreasing from 12.1 months since 2009Q1. 4.3 months for homes valued at $250,000 to $500,000, decreasing from 23.6 months since 2009Q1. In 2015, 64.3% of the housing units in Walla Walla County, WA were occupied by their owner, as opposed to a renter. This percentage has been growing, rising from 62.7% in 2014. Walla Walla has an affordable housing crisis. For families who make more than 50% of the median family income (>$27,000/year), while there are still issues of market supply, there is not the same critical problem we see for those making less than 50% of the median wage in Walla Walla. The Washington State Housing Needs Assessment makes it clear that with only 8 homes for every 100 needed in the 0-30% of median income group (<$17,000/year), there is a crisis. The projected increase of 1 home for every 100 needed by 2019 demonstrates that this crisis will not solve itself. 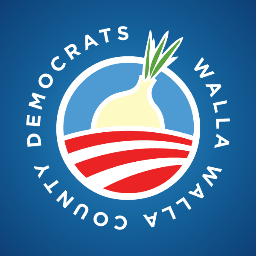 There must be significant attention and investment from the Walla Walla community to correct the issue. Walla Walla County is currently in year 2 of Walla Walla County Department of Community Health’s 5 year plan to end homelessness and create affordable housing. In the next piece, we will next examine the timetable regarding tax increases and community opportunities for involvement.